There are several diseases that can affect your beloved asparagus. And not just affect lightly—it can severely stunt their growth and in worse cases, kill them. It is important to know the signs and symptoms of these diseases so treatment can be applied early. Three of the most common diseases known to affect asparagus are Asparagus Rust, Fusarium Root and Crown Rot, and Botrytis Blight. 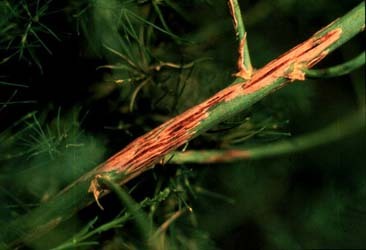 Asparagus rust is a fungus that thrives in the tissues of asparagus and drains it of nutrients. When that happens, the foliage falls off prematurely making the whole plant stunted. To control this disease, you can use fungicides on your crop. There are also protective chemicals that would prevent the rust from infecting your asparagus. You should also get rid of neighbouring, wild asparagus and if possible, start your asparagus nursery far from established fields. Plant a variety that is resistant to rust would also help future plantings. Another disease that could damage asparagus is Fusarium Root and Crown Rot. The fungi that cause this disease are soil-borne and it affects the roots, crowns and stems. It attacks not only asparagus but also grasses and corn. Symptoms of this disease include wilting of the spears, shriveling and yellowing of stalks, and hollow crowns. Since the fungi are almost always present in the soil, avoiding or getting rid of them is next to impossible. The key is to minimize the effect it has on your crops. To do so, it is important to use treated seeds, follow proper transplanting, minimize stress, especially in young crops and seedlings. You can also fumigate the soil to minimize infection. Asparagus is susceptible to the disease Botrytis Blight during hot but moist temperatures. It spreads itself through the wind and rain. Crops that are affected by this disease manifest lesions that are tan in colour with a yellow halo. In worse cases, crops may be entirely covered by a dark, blackish and fuzzy covering and even newly-emerged asparagus may be blighted completely. There are available pesticides that can control Botrytis Blight. But it is better to use preventive control instead. Proper plant spacing, pruning, discarding faded leaves and other plant parts will help. However do not prune during wet days to prevent the fungus from spreading.